I won’t pretend to know the first thing about The Decameron. I don’t care to learn about 14th century Italian novellas either. But since that seems to be the only important use of the word “auncient,” ever, I figured I’d have to use it. “Auncient” of course, is just an obsolete form of “ancient,” and for some reason the town of Bethlehem clings to it. 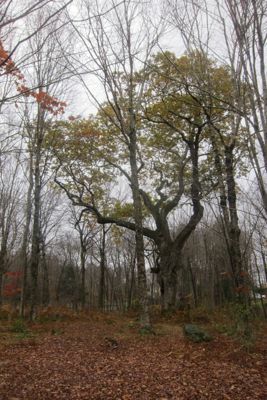 For this tree is called the Auncient Oak, which stands tall in the Bethlehem Land Trust’s “Auncient Oak parcel,” on, you guessed it, Auncient Oak Road. 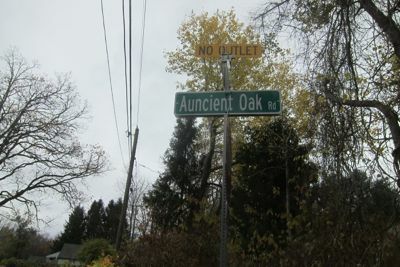 Auncient Oak Road is a dead end road in the middle of nowhere, lined by rather nice half million dollar homes. Where these people work and play boggles my mind to be honest with you. Litchfield’s tony center is not far away at all, but really, who wants to live out here? Well, tree lovers would be one subset. This is a lovely old red oak. Over the years, I’ve received a few emails and comments about the tree, but no histories or interesting facts about it. Nor can I find any online. One of those emails resulted in a rather fawning blog post about yours truly. It still makes me chuckle. I think what makes it interesting is merely its size, its protected status, and more importantly, the fact that it retains the name “Auncient Oak” for some reason. But this is Bethlehem; the town which unapologetically celebrates its biblical etymological roots. It calls itself “Christmas Town” and celebrates that purely Christian fact annually. Bethlehem is a unique enclave in this liberal heathen gay married state of Connecticut. To sum up, there’s a big old red oak on a dead end in the western part of Bethlehem off the truly beautiful drive down Todd Hill Road (a drive I would not want to do in snow). It is just south of Morris and just east of Washington, if that gives you any indication of how you have no idea where this thing is. Note: Other young trees in the picture look taller because of perspective. They are not taller. I didn’t exit the car to touch the tree because me 3-year-old was getting a quickie nap in… and just as you don’t mess with Bethelehem’s ways, you don’t mess with my 3-year-old’s naps, rare as they are becoming. My sister sent me this link today. We grew up in Bethlehem (my parents still live there) but never heard of it. I live in WA now, but am a Fairfield U grad (1990) and UCONN Grad School Alum (Ph.D, 1995) and so is my husband (Ph.D 1996). I am a stay at home mom who homeschools. We also understand about the challenges of raising special needs children. We have one child with Asperger’s/ADHD (age 16) and another with ADHD and anxiety (7). It is indeed a challenge but a blessing as well, as you learn so much about yourself that you couldn’t have otherwise. God bless you and your family!